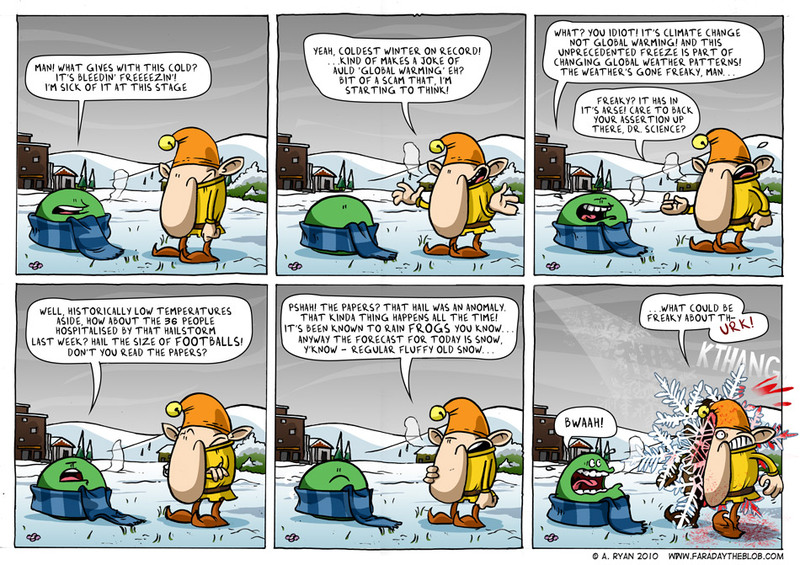 This entry was posted on Friday, January 15th, 2010 at 2:14 pm and is filed under Comics. You can follow any responses to this entry through the RSS 2.0 feed. You can skip to the end and leave a response. Pinging is currently not allowed. Now I’m all freaked out that I’ll get kthanged by a snowflake, thanks. Couldn’t evolve my exoskelton fast enough, so I’ve take to wearing my hockey helmet day and night. Makes me look ‘special’, but you can’t be too careful in these uncertain times. The Blob has more attitude than i remember from the skool daze..
Colm - More power to yer memory! I love ‘climate change’ … great how terminology changes once one tax-raising excuse is proven to be bull … Warmest period in the last 2000 years was the Medieval Warm Period about 800 years ago… but hey, Cap&Trade will make the rich even richer.